Rainbow Trails / Penyffordd at Dyfnant & Vyrnwy Forests (NRW)0300 065 3000work Horse RouteDyfnant Forest is home to the Dyfnant Rainbow Trails, designed with horses in mind but also welcoming walkers. There are 5 waymarked trails starting from the Penyffordd Car Park. The trails through rolling hills and lush green valleys range from the easiest which is the 5 mile Banwy Trot or, for the more experienced, two 16 milers for a full day's ride. Follow in the footsteps of St. Melangell with a view of the craggy hill of Allt Dolanog. Take in some amazing views of the Vyrnwy valley. Trot along part of Glyndwr’s Way national trail with impressive views of the Conwy valley. 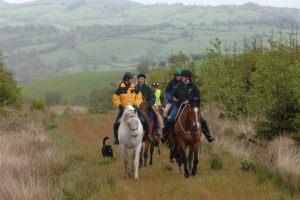 Enjoy excellent views of the Banw valley on this trail suitable for novice riders. The trail leads past the Cerrig yr Helfa hunting stones and gives lovely views over the Arran and Berwyn mountains. Penyffordd Car Park is purpose built with a one way system that allows drivers of horse boxes a roll in roll out system. There is ample parking for horse trailers and cars as well as a corral for horses. Dyfnant Forest is home to the Dyfnant Rainbow Trails, designed with horses in mind but also welcoming walkers. There are 5 waymarked trails starting from the Penyffordd Car Park. The trails through rolling hills and lush green valleys range from the easiest which is the 5 mile Banwy Trot or, for the more experienced, two 16 milers for a full day's ride. Carriage driving trails in the Dyfnant Forest start from Hendre Car Park just before Pont Llogel.